When purchasing packaged fresh beef in a food store, the packages should be cold and the meat should be firm. The packaging should be in good condition with no tears or holes in the wrapping. 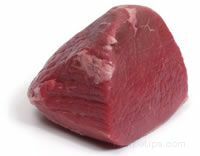 Beef that has begun to turn a gray color, has dried out edges, and does not smell fresh, should not be purchased. Fat on the edges of a beef cut should be a creamy white color (pictured right) and never yellow. Beef that has a slimy feel should be avoided. Excess liquid may indicate that the beef is old or has been stored at the incorrect temperature. It may also indicate that the meat has been previously frozen. Beef that has little excess liquid in the package is the best to purchase. The best beef has a bright red color (pictured right). Packaged beef with a bluish-red color indicates that the beef has had a lack of exposure to oxygen due to the packaging. The beef will change to a brighter red once it is removed from the packaging and air has had a chance to circulate around it. Areas of darker red coloring are normal when oxidation occurs. Aged beef has a very dark surface. Marbling (pictured right), which refers to bits of fat that may be distributed throughout a cut of meat, is highly desirable in beef cuts. The small bits of fat tend to melt during cooking, which adds flavor to the beef and tenderizes it as it cooks. Cuts with the best marbling are usually rated "Prime" and are most often sold to restaurants and meat markets rather than to food stores. The marbling in prime cuts looks like fine strands that run throughout the meat. Large quantities of very thick strands of marbling are found in lower grades of beef. Lean beef tends to be tougher after cooking because of the lack of marbling. The lean beef may be lower in fat and calories, but it lacks the tenderness and flavor of well marbled beef cuts.